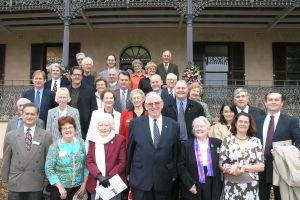 The 27th April 2007, marked the opening of the refurbished Brush Farm homestead built by Gregory Blaxland in 1820 for his family. All Holt Family Fellowship members were invited by Courtney Long of Ryde City Council to attend the opening because of General Joseph Holt's earlier association with The Brush as manager for Captain William Cox. It was purchased from Captain John Macarthur soon after their arrival in January 1800. To meet the unexpected calls on his promissory notes, William later sold it to Gregory in 1807 having increased its size substantially by having his manager, Joseph Holt, purchase neighbouring properties on his behalf. Pamela Goesch, (Elizabeth Holt), John Holt (Isaac Holt), Clare Steenhouwer (Isaac Holt), John and Gail Metcalfe (Elizabeth Holt) and Lionel Fowler (Elizabeth Holt) represented The Holt Family Fellowship. They met various dignitaries including the President of The Brush Farm Historical Society Mrs Beverly McClymont, the current Gregory Blaxland and the Parramatta River Historian, Gregory Blaxcell, whose article in the Afloat Magazine had stimulated great interest. Beverly and Lionel recognised each other from the days of Associate Professor Jack's W.E.A. archeological students 'digs' at John Blaxland's former Flour Mill and Brewery on Lionel's Grove Farm at Wallacia in the 1980s. Our party was disappointed to find that the huge magnificent cast-iron fire-place which was in the middle of the drawing room's floor during Pamela Goesch's Retrace Joseph Holt's Footsteps tour in Y2000 had been stolen during the intervening years. That tour finished at The King's School, where Dr Ruan O'Donnell gave a talk on Joseph's career in Ireland for the benefit of members. 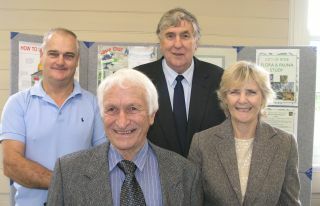 It is intended for the Blaxland family and The Brush Farm Historical Society to hold separate get-to-gethers with us at both Brush Farm and Grove Farm in the future with our friends from the local The Weekly Times, John Booth and Ulrike Eichmeyer who have generously donated their newspaper's articles and photos to our website. The Weekly Times published an article on the restoration of Brush Farm House in it's 2nd May 2007 edition.